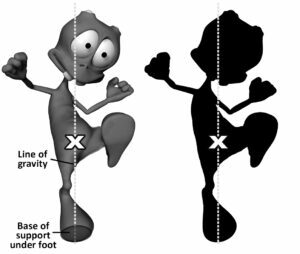 This post is the second in a series on applying the physics concept of center of gravity to character design. In the previous post in this series, we looked at finding a character’s center of gravity, which is usually just below its belly button. When creating a model sheet, you probably have an idea of where the center of gravity sits. But really, the only way to be sure is to put the character in various poses and see if the poses work with the center of gravity you’ve chosen. A character with a big head or chest with a higher center of mass might be thrown off balance by a small shift like bending over. Line of gravity – a line that passes vertically through the center of gravity. Center of pressure – the spot where the line of gravity hits the ground. Base of support – the area of the object that touches the ground it is sitting on. When an object has more than one area of contact, the base of support includes the area between the contact points. If a character is standing on two feet, the base of support includes the area between its feet. If the center of pressure is within the base of support, the object or character is balanced. If the center of pressure is outside the base of support, the object or character will tip over. This principle also applies to characters. For any pose where the character is balanced (not tipping over), the line of gravity should hit the base of support. If it does, the balance works. If not, you have more work to do in setting your poses or placing the center of gravity. To figure these things out, try working with the character’s poses in silhouette. In the next post, you will learn about placing the center of mass for characters with more than two legs, such as animals. You can find out more about center of gravity in the Forces chapter in the Physics for Animators book.